One sketch from the pilot episode of Portlandia, Carrie Brownstein and Fred Armisen’s eclectic homage to the niche (read: hipster) culture of Portland, Oregon, has always resonated with me. Surrounded by an iPad, Macbook, and iPhone, Armisen becomes entrenched in what can only be described as a technological Scylla and Charybdis: as soon as he checks one buzzing device, another one beeps. He watches a video on YouTube, proclaims that he is determined to get through his Netflix queue, texts, tweets, sends e-mails, and snaps photos until Brownstein finally jolts him out of his trance by showing him a framed picture of himself when he was in high school. “See how happy you were?” she cries, overlooking his unfortunate, outdated hairstyle. They decide to both go “off the grid” by installing “Mind Fi,” an app that allows them to communicate telepathically. 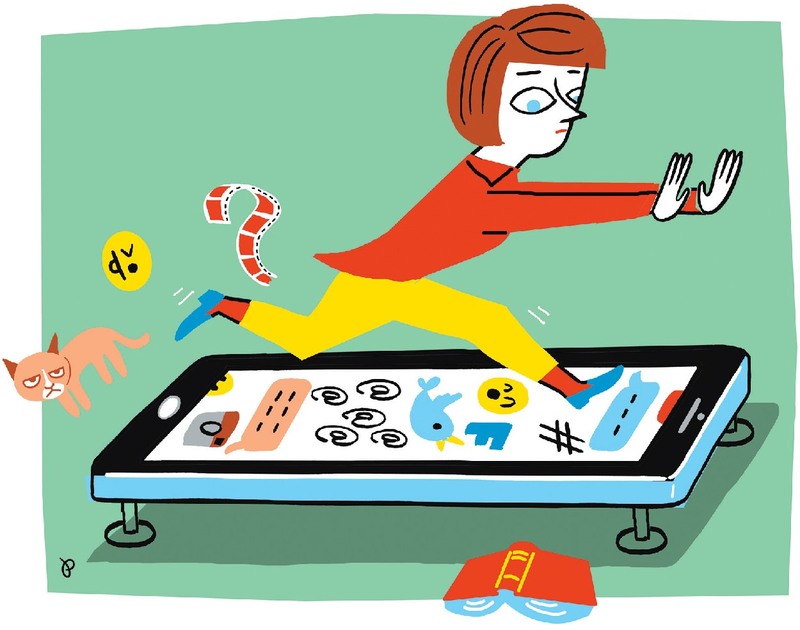 Even if you long for a technological purge, there’s an app for that. I can’t help but think of that scene whenever I sit down to complete my homework. I rarely crack open a book before spending at least 30 minutes responding to e-mails about everything from meetings to TF office hours to scheduling time to see friends for meals. Then I must spend another 15 minutes making sure all these delicately planned events go into my physical planner and also a Google calendar, lest I have to burrow through hundreds of messages to rediscover the particulars of a nearly forgotten appointment. If this were Portlandia, a well-intentioned character might show me a picture of myself from simpler times (though in reality, my online habits were probably worse in high school—and I’d prefer not to remember any of my past hairstyles). During my sophomore year of college, I requested a watch for Christmas with the hope that I could maintain my schedule while doing homework, without ever consulting my phone. In the year since, I’ve gone to the library sans portable electronics exactly zero times, and probably posted between three and five photos of the watch on Instagram. I did manage to go several weeks without a smartphone during the summer, though not by choice: a skilled pickpocket in Germany is surely enjoying my collection of Simon & Garfunkel. My parents were not pleased with the loss, but it was understood that I needed a replacement—as a college student in 2015, not being connected is not really an option. Being away from e-mails and text messages means missing out on things ranging from the purely social, such as deciding on dinnertime with blockmates, to academic, like receiving a last-minute assignment or notifications about University operations. During a February snow day that was preceded by another snow day, one of my roommates received an e-mail at 12:30 a.m., notifying her that she was to be present at her computer by 10 a.m. to participate in an online makeup class. Our shouts of glee about another day off were replaced with cries of outrage: could she be held responsible for a message sent at such an hour? We all agreed that it might be presumed she had gone to bed early and planned to sleep in, past the appointed hour. That may not have been the most responsible decision, but when professors and TFs begin to assume that students are academically available 24/7, a line must be drawn somewhere. Allowing a 24-hour window seems entirely reasonable—how, then, did messages regarding classes and assignments sent at “witching hour” become the norm? “The Networked Student,” a 1999 Undergraduate column by Jennifer 8. Lee ’99, provides interesting insight on how students’ schedules, studies, and communication habits have evolved due to the growing ubiquity of laptops and cell phones. I am sure it was the proverbial “millennial” in me that audibly scoffed when I read that “Libraries have signs gently admonishing students to use their computers in areas preapproved for keyboard clicking”; what is Lamont today without its legions of the sleep-deprived all tapping away on varying models of the same sleek chrome device? Lee observed long lines forming around “e-mail kiosks” where students could check their electronic messages between classes. Today’s “kiosks,” I suppose, are the miniature computers that 95.8 percent of the first-year students carry in their pockets, according to The Harvard Crimson’s Class of 2018 Freshman Survey. (Only 3.9 percent of students reported having a non-smartphone; only 0.3 percent—that would be five members of the class—said they had no cellphone at all.) Although these statistics reflect many things—the increasing affordability of devices once considered a luxury, better technology that has made cell phones fast and efficient—the biggest takeaway, to me, is that being constantly connected is no longer an asset: it is an expectation. I noticed this semester just how deep the connection between academia and technology has become, because many of my professors have adopted an “If you can’t beat ’em, join ’em” mentality. If you give students a buzzing device, they will most likely check it during the course of a lecture; in that case, why not imbue that hotspot of connectivity with an academic purpose? In one of my classes, “Pyramid Schemes: The Archaeological History of Ancient Egypt,” we receive a code at the beginning of each class that allows us to plug into a website where we answer quick questions about material in the lecture, using an Internet-connected device of our choosing. In another large class, the lights often stay off after the screening of videos or demonstrations. For students who dutifully take notes on glowing laptops or tablets, neither of these teaching styles poses a problem. But for a shameless Internet addict like me, incorporating a device into classroom teaching all but sanctions my distraction. At the beginning of the semester, I firmly made a no-laptop-or-cell-phone rule, and took notes by hand. But after several weeks of squinting in dim light and squirming uncomfortably while everyone around me tapped out an answer, I gave in and reintroduced my computer to class. Unchecked access to communication has undoubtedly transformed the undergraduate experience at Harvard. Being able to make and break plans with a few swift clicks makes our schedules more malleable and subject to quick change. But these changes come with related responsibility, and a mutual understanding: if I can ask for an extension via e-mail the day before an assignment is due, a professor can call for an online class during a snow day; if I cancel social plans with a text message, there’s no reason a friend can’t or won’t do the same to me at a moment’s notice. The sketch from Portlandia rings so true to me because it is easy to get caught up in the idea that how we conduct ourselves in front of a screen reflects how we are seen in three-dimensional life. When I am alone in a library, facing massive amounts of reading I can never get done, I can still feel productive by replying promptly to e-mails and balancing a precariously loaded calendar, because—at least to the people I’m accommodating—it seems like my life is under control, even when it is anything but. I could say I will take a Luddite approach to life: I’ll delete my Google calendar and curl up with my Moleskine. I will check out a library book instead of frantically searching for the text on Project Gutenberg on my tablet the day before a midterm. I could schedule specific times to check my e-mail and use Internet applications to block distracting websites when I am in class. But in college, being in sync with the flow of student life means being part of a network. You are a hub, with your inbox as a crucial meeting ground. Given the ease and demands of our current technological circumstances, we truly are “on call” 24/7. The only thing that keeps me from feeling totally overwhelmed is knowing that at the end of the day, I will not succeed at keeping up with it all. I will inevitably receive more messages than I can reply to. When I am in the library, staring at a long night’s worth of homework that can be put off no longer, the panic will probably steer my attention to a cat video on YouTube, at least for a few minutes. But if this were 1999, and I were sitting in the library’s designated “no-typing zone,” I probably would be doodling. My habits, for better or for worse, are not created by technology, but only magnified. The true pressure is created when we feel as though our digital inadequacies translate into disappointment and failure in real life—such as when we miss a message regarding an important assignment—or feel guilty about sleeping in on a snow day when we know we may be ignoring an e-mail about a 10 a.m. class online. It is important for us as students, and for our professors as our educators, to determine what constitutes a healthy level of expectation to demand of each other regarding online connectivity. Perhaps syllabi can specify “e-mail office hours,” during which both parties are expected to check for and respond to messages. Maybe we can also be more honest with our friends about what events we can make, and learn not to rely on the opportunity to cancel plans or ask for a favor just because text messages can be exchanged almost instantaneously. Everyone else’s calendar has been balanced just as delicately, and canceling or creating meetings at the last minute inevitably affects several people, or even an organization, perpetuating the culture of frantic, time-sensitive messaging. And if we absolutely must alter schedules at the last minute, let’s do so in a timely manner, and be clear about our reasons—because unfortunately, or perhaps fortunately, Portlandia’s imaginative Mind-Fi is not yet a reality. Methods of communication will only multiply as phones become smarter; we have to become smarter along with them. Berta Greenwald Ledecky Undergraduate Fellow Olivia Munk ’16 has not yet gone off the grid.